The Varsity Girls Tennis team handily beat Notre Dame 6-1. The current record is 8-6. 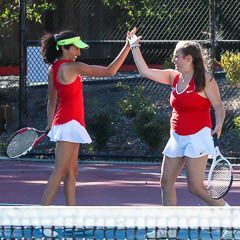 Crystal Girls Tennis had a 2-5 loss today against a strong Castilleja team. Our #1 doubles team Lindsey H and Camille L beat a tough team 6-2,6-3. #3 doubles team Julia S and Rhea D won their match easily 6-3,6-1. All the girls played some amazing tennis! Crystal Girls Tennis had an easy win on 9/25 defeating Notre Dame, Belmont 6-1. All the girls played amazing tennis. Gryphons tennis is currently 7-2 and the team has been playing strong all season.